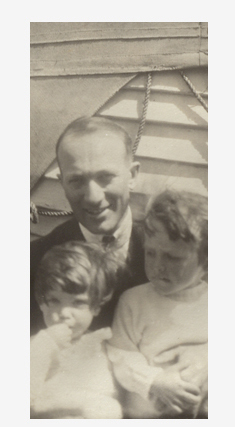 Wilder Penfield was born in Spokane, Washington, on January 26, 1891, the son of Jean Penfield and Charles Samuel Penfield, a successful physician. When the Penfields' marriage began to unravel and his father's medical practice began to suffer, Wilder moved with his mother and two older siblings to live with his maternal grandparents in Hudson, Wisconsin. In Hudson Jean Penfield established a small private boarding school for boys, the Galahad School. Jean hoped that the preparatory education he received there would pave Wilder's way to a Rhodes Scholarship. Completing high school in 1909, Wilder left Hudson to study at Princeton University. At Princeton he was a member and later coach of the Princeton football team, belonged to a group promoting the former Princeton President Woodrow Wilson for president of the United States, and even volunteered as a Sunday School teacher. As he claimed in his autobiography, while he was reticent about following in his father's footsteps, he was inspired to study medicine by his Princeton biology professor, Edward Conklin, as well as by a visit to the gallery of the operating theatre at New York's Presbyterian Hospital. Although he won a Rhodes Scholarship in 1914, Wilder did not begin his studies at Oxford until the beginning of 1915. He delayed beginning his scholarship because of the outbreak of World War I, but later changed his mind when a friend sent word from Oxford that with many of the British students off at war, American students had unique access to faculty members. At Oxford, Wilder called upon the Regius Professor of Medicine Sir William Osler for assistance in arranging that he take only the medical courses required for the first two years of medical study at Johns Hopkins rather than take the three years required to complete a degree at Oxford. Sympathetic to Wilder's wish to complete his studies as quickly as possible, Osler helped make the necessary arrangements, and also became a mentor to Wilder, taking the young medical student with him on visits to local hospitals. Another significant influence upon Wilder's Oxford education, as well as his future medical career, was Charles Sherrington's course in mammalian physiology. It was through his initial studies with Sherrington, as well as additional research in Sherrington's laboratory during graduate studies in 1919 and 1920 that Wilder was introduced to the study of the brain. While on his Rhodes Scholarship, Wilder volunteered during the summer of 1915 at a French military hospital at Ris Orangis in the suburbs of Paris. Returning to volunteer again in March 1916, Wilder suffered a broken leg when a German U-Boat torpedoed his ship, the S.S. Sussex. Initially sent to the military hospital at Dover, Wilder spent part of his convalescence being cared for by the Oslers at their Oxford residence, 13 Norham Gardens. Wilder returned to the United States in the summer of 1916 to continue his medical studies at Johns Hopkins School of Medicine. In 1917 he again put his training on hold to marry his long-time fiancée, Helen Kermott. The two then sailed to France where they intended to volunteer at a Red Cross hospital in Paris. Returning again to Johns Hopkins at the end of the year, Wilder graduated with his MD in 1918. From 1918 to 1919, the now Dr. Penfield was a surgical intern at Boston's Peter Bent Brigham Hospital, where he was able to observe the work of the talented neurosurgeon, Harvey Cushing. Cushing had just returned from working as a surgeon in France, where, among many other patients, he had helped treat Osler's only son, Revere, when the twenty-one-year-old was mortally wounded at the Third Battle of Ypres (Passchendaele). It was during his year in Boston that Penfield decided to specialize in brain surgery. According to Penfield, this decision was at least partially the result of his observing Cushing in the operating theatre. Cushing was showing how dramatic and often dangerous brain surgeries could be carried out with a relatively high success rate, but Penfield believed that Cushing's success was partially due to the limited range of cases he took on, principally brain tumours and neuralgia. Wishing to build upon the work that Cushing had made in legitimizing the field of neurosurgery, Penfield wanted to combine neurosurgery with neuropathology, neuroanatomy, neurocytology, and clinical neurology so that he would be able to do basic research, conduct lab tests, diagnose patients, and operate. At that point all such fields were quite separate, but Penfield recognized how their integration could lead to a more rapid and complete understanding of the brain, as well as to advances in how it could be treated. Returning to Oxford in 1919, Penfield was offered graduate research work in Sherrington's lab on decerebrate rigidity, the microscopic structure of the nervous system, and reflex leg actions in cats. In 1920 he continued his graduate studies in London at the National Hospital for Nervous Diseases (Queen Square), where he learned about neurological diagnosis from Gordon Holmes, neuropathology from J. Godwin Greenfield, and carried out his first neurosurgical procedures with Percy Sargent. However, as Penfield notes in his partial autobiography, even at Queen Square he noticed how neurologists and neurosurgeons did not always work closely together. Neurologists such as Holmes frequently refrained from referring patients for surgery, often believing neurosurgery to be too risky, and that even terminal cases would enjoy longer and more fruitful lives if treated non-surgically. Penfield claimed that this was a situation he wished to help change. In 1921 the Penfields returned to the United States and Dr. Penfield took the position of neurosurgeon at the surgical department of the Presbyterian Hospital and College of Physicians and Surgeons of Columbia University, where he remained for the next seven years. During this time, Penfield not only acted as a neurosurgeon, but also consulted on clinical cases and continued previous neuropathological research. As part of this research Penfield attempted to discover the source of epileptic attacks, building upon work on soldiers from the First World War who had suffered head injuries, many of whom developed epilepsy. In the laboratory, however, Penfield found that he lacked the appropriate microscope slide staining techniques to be able to see tissue cells clearly. He travelled to Spain to learn a nerve cell staining technique developed by the neurologist Ramón y Cajal. Learning the technique from Cajal's former student, Pio del Rio-Hortega, Penfield returned to New York with the hope that by using the staining technique to examine the scar tissue of patients with post-traumatic epilepsy he might discover how such scarring causes epilepsy. Joined by a young research fellow, William Cone, Penfield received funding from the Rockefeller family to establish a laboratory of neurocytology at the Presbyterian Hospital. In 1927 Penfield was contacted by the McGill Professor of Surgery and Surgical Chief at the Royal Victoria Hospital (RVH), Edward Archibald. Archibald was writing to invite Penfield to come to Montreal to take over neurosurgery at the RVH, a position that included a teaching post in McGill's medical faculty. Penfield agreed to come to Montreal on the condition that he be provided with facilities for a neurocytology laboratory, Bill Cone would accompany him as head of the new neurosurgical clinic, and he be able to draw upon neurological cases from both the RVH and the Montreal General Hospital. However, before coming to Canada in 1928, Penfield and his family took a six-month trip to Europe during which he worked with Professor Otfrid Foerster in Breslau, Germany. By this point the Penfield family included four children: Wilder Jr. (b. 1918), Ruth Mary (b. 1919), Priscilla (b. 1926), and Amos Jefferson (Jeff) (b. 1927). In Germany Penfield examined samples of brain tissue taken from patients on whom Dr. Foerster had operated for post-traumatic epilepsy, hoping that such samples would offer insights into the causes of the condition. In Breslau Penfield also learned Foerster's method of using light electrical stimulation of the exposed brain of a conscious patient in order to identify areas of the brain which should be avoided during the excision of tissue, such as speech and motor areas. This approach to mapping healthy and damaged portions of the brain would eventually become central to Penfield's future work on identifying and removing tissue thought to cause epilepsy. While beginning to make important contributions to neurology and neurosurgery, particularly with his epilepsy research, Penfield recognized that developments in the field were occurring at a pace that was difficult for one or two practitioners. Thus, only a few months after arriving in Montreal, Penfield approached McGill with the idea of establishing a neurological institute and hospital. He believed that such a dedicated institution would attract experts in the field, allowing for increased brain research and, in turn, more successful treatments. Upon receiving encouragement from McGill and the Royal Victoria Hospital for the proposed institute, Penfield approached the Rockefeller Foundation for financial support. However, the foundation initially declined to offer funding. In February 1931 Penfield was informed by the Rockefeller Foundation that its new Medical Education Division head, Alan Gregg, wanted to discuss the institute proposal. Penfield resubmitted his funding application and was awarded a Rockefeller grant of over $1.25 million in April 1932 for the construction and outfitting of a neurological institute. Construction of the Montreal Neurological Institute (MNI) began in the fall of 1933, with a cornerstone laying ceremony held in October led by McGill's Chancellor, Sir Arthur Currie. Between its opening and the beginning of the Second World War the MNI attracted researchers from around the world and acted as a training ground for numerous Canadian neurologists and neurosurgeons. They benefitted from Penfield's wish to create a research and hospital centre which would seek both improved treatments for neurological conditions, as well as a further understanding of the functions of the brain in both its healthy and unhealthy states. As Penfield had intended, the MNI saw the close collaboration of neurology and neurosurgery. The MNI integrated the neurocytology and neurophysiology work previously conducted at the RVH, and developed new research areas, including neuroradiology and neurochemistry. The Institute became a model for other integrated neurological research hospitals around the world, attracting international associates and fellows who later established centres based upon the MNI's example. With the outbreak of the war the MNI organized a sister hospital that was to be established in England and intended to treat injured soldiers and civilians. While many staff members of the MNI went to work at No. 1 Neurological Hospital in Basingstoke, Hampshire, Penfield remained behind at the MNI. In Montreal Penfield led the mobilization of the MNI on a wartime footing. This included launching research into causes of and potential remedies for pilot blackouts at high altitudes, sea sickness, the safe transport of patients with head wounds by air at high altitudes, and the effect of newly developed antibiotics on the brain. In addition, Penfield undertook a report for the National Research Council on the surgical treatment of war wounds and studied how the Canadian Medical Corps dealt with head wounds, eventually writing a military manual on the subject in 1941. In 1943 Penfield visited the USSR and China in order to report to the National Research Council on the two countries' medical research, hospital conditions, and treatment of wounded soldiers. Following the war, Penfield continued his research with Herbert Jasper on locating the sources of epileptic seizures, describing their patterns, and mapping the brain. Dr. Jasper, who had come to the MNI in 1938, had introduced Penfield to the use of electroencephalography (EEG) to locate the origin of focal epileptic seizures. Using a series of electrodes attached to the skull, an EEG could measure the electrical output of different regions of the brain. Because abnormal tissue gives off different patterns than healthy tissue, a neurosurgeon could target unhealthy tissue for removal to relieve seizures. Using EEG and mild electrical probing of the brain, Penfield also advanced the mapping of the brain, particularly the temporal lobe, which was the source of a large proportion of patients' epileptic seizures and which he came to understand played a central role in memory, memory recall, emotions, language, as well as auditory and visual functions. Out of this research, Penfield and his team developed an operation often referred to as the 'Montreal Procedure,' which involved removing a portion of the temporal lobe. It was eventually adopted throughout the world for its success in relieving patients of temporal lobe seizures. For Penfield's research and operative work, he received numerous national and international awards including the Order of Canada and the Légion d'honneur, and was the second Canadian ever to receive Britain's Order of Merit. Following his retirement in 1960, Penfield dedicated much of his time to various public service causes, as well as employing his understanding of the brain to speak and write about various subjects from education policies and bilingualism to consciousness. Always pursuing new projects, Penfield died in April 1976 at the age of 85, having just completed his partial autobiography and history of the establishment of the MNI, No Man Alone.